Steve Austin’s Sean Long makes a play on a ball hit back up the middle Tuesday night. In other action, Bet-R-Buy Auto Sales defeated Shirt Stop 14-1 Monday night in coach pitch softball. Outstanding players for Bet-R-Buy were Londyn Loveless and Lanee Russell. Outstanding players for Shirt Stop were Jenna Weimer and Aubrie Retterer. 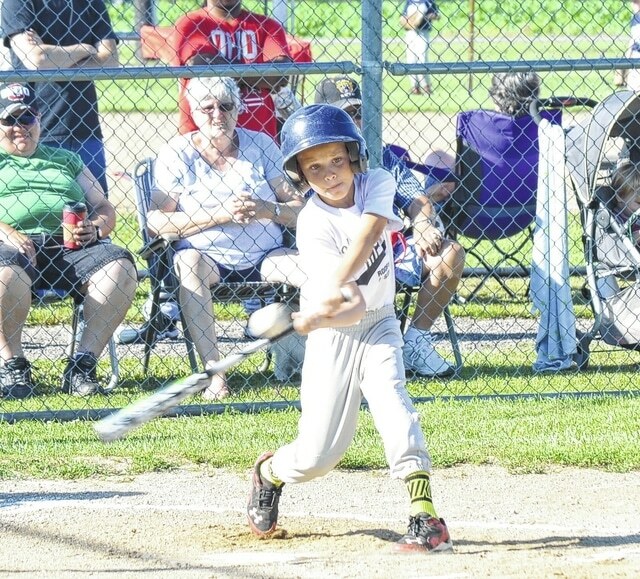 Hoffman’s Roofing and Siding’s Jackson Wilhelm hits a ball to the right side Tuesday.